September 6, 2009, PORTO, Portugal –With another pulsating fight for the title after Britain’s Paul Bonhomme moved into first place just in front of defending champion Hannes Arch of Austria going into the penultimate race of the 2009 season in Porto and Gaia, Portugal on 12/13 September. American Michael Goulian claimed the first victory of his career in the last race in Budapest while Bonhomme took second, good enough to knock Arch off the top of the championship standings for the first time in 2009. Goulian and Kirby Chambliss, who got a second consecutive third place in Budapest, will be looking to put pressure on the leaders. The Portuguese cities on the Douro River will be hosting the race for the third year running after more than 650,000 spectators watched the world’s best pilots in action in 2007 and 2008 on one of the fastest tracks on the calendar. 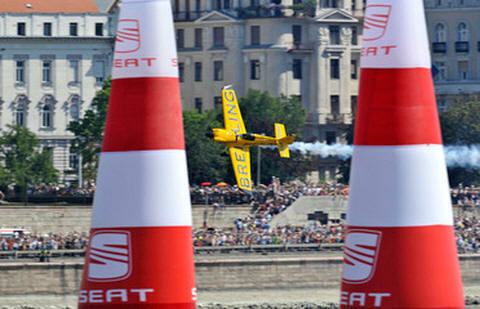 Bonhomme, who surrendered the championship lead to Arch with an untimely stumble in Porto last year, snatched first place back from Arch in Budapest. No pilot has won more than one race this year as the competition has grown intense. Goulian became the fourth different winner in four races this year with his stunning victory in front of 650,000 spectators in Budapest. Another illustration of the fierce battle for points is that a total of 11 different pilots in the 15-man field made it into the Top 5 at least once – Bonhomme, Arch, France’s Nicolas Ivanoff, Americans Goulian, Chambliss, and Mike Mangold as well as Britain’s Nigel Lamb, Hungary’s Peter Besenyei, Russia’s Sergey Rakhmanin along with rookies Matt Hall of Australia and Matthias Dolderer of Germany. A sharp narrowing of the gap between the leaders and the chasing pack has made the 2009 championship battle the most exciting ever. Last year a total of one million spectators packed the banks of the Douro River during the two days of racing against the backdrop of the famous red-tiled roofs lining the steep river valley, making it one of the biggest crowds ever at a sporting event in Portugal. This year Qualifying takes place on Saturday 12 September at 14:30 local time followed by Race Day on Sunday 13 September starting at 14:00. Matt Hall in the Austrian Outback, Salzburg, Austria – Matt Hall would have never imagined taking off in his first season of the Red Bull Air Race World Championship the way he did. The former Australian Top Gun pilot was hoping to have made the Top 12 in two races and perhaps into one Super 8 by the mid of the season – a realistic and solid goal for a newcomer to the world’s most exciting motor sport - but his performance has exceeded all expectations, not least his own. The always happy pilot from Down Under is already writing air race history by becoming the most successful pilot in his first season. The opening race in Abu Dhabi saw a sterling start for the Australian newcomer who finished in a sensational fifth position in his first race. 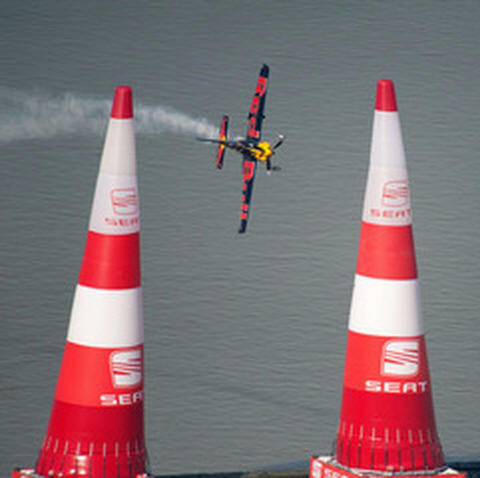 Even though the rookie had clearly shaken up the field with this amazing start, some may have suspected that it was purely luck that enabled the 38-year old to do so well in his first ever Red Bull Air Race. How wrong would they be! On the American West Coast Hall proved that his result in the season opener was not a one off by finishing just outside the Top 4 again, coming in fifth place in San Diego. Hall also sees his background as a fighter pilot advantageous in the competition for a number of reasons. “Not only am I used to pulling a lot of G at low level whilst flying very accurately, I have also gained over the years great organization skills, allowing me to priorities what is important, as well as leadership skills which I think are working to bring the team together and perform,” says Hall. Austrian Outback, for the second half of the season the Aussie has developed his very own game plan. He brought his whole family over to Austria for the European leg of the World Championship and moved into a house approximately 15 km northeast of Salzburg, on the east side of the Gaisberg Mountain. This way he avoids the jet lag he would suffer if he was to travel between Australia and each European race. The Australian had spent a little time in Europe with the military, though in the last 18 months, he says he has seen more of Europe than he would ever have imagined. Salzburg has become a second home for the Hall family and Matt is comfortable flying anywhere needed. The pressure of flying under the bridge, race number 4 in Budapest presented quite a few challenges for the newcomers in the field. Compared to the first three races of the season, the tight and twisting race track in the Hungarian capital contained lots of vertical maneuvers as well as a breath-taking challenge right at the start of the battle – flying underneath the picturesque Chain Bridge which marked the start and finish of the track. All the rookies had to do some ‘pre-bridge’ training practicing flying under a rope and under the real bridge to get used to the low level and prepare mentally for the challenge. “You have the bridge, the water and the gate on the other side of the bridge – and you have to watch your entry speed of 370 km/h. It’s for sure not easy to do, it’s pretty busy and a big task,” explains Steve Jones, former Red Bull Air Race pilot and rookie coach. For the Australian it has not exactly been a walk in the park in the Budapest race as he picked up a 2 second penalty in the Super 8 round and admitted that the busy entry into the track definitely had an impact on his flying. “My rhythm going into the track was definitely affected by the distraction,” acknowledged the Aussie who ended up in 7th place. Despite being disappointed not finishing higher, Hall is confident he can keep the plane going fast and sort out a few instrumentation issues in time for Porto. Between races the Halls are planning to do some road trips to other countries which Matt says is a very unusual thing for an Australian. And despite the language issues the neo-Austrians are certain that a little bit of knowledge and some generic sign language will get them what they need. Hall’s striking performance in his first season currently holds him in 5th position in the World Championship ranking having outpaced some of the older and more experienced pilots. At least by now the veterans have realized that the rookie from Austria is the one to watch very carefully.